Sushma Swaraj told her Chinese counterpart Wang Yi during a meeting earlier this week, the government said on Wednesday. NEW DELHI: Peace along the India-China border is a pre-requisite for strong bilateral relations, External Affairs Minister Sushma Swaraj told her Chinese counterpart Wang Yi during a meeting earlier this week, the government said on Wednesday. Both Sushma Swaraj and Wang Yi also noted the "challenge" that the Doklam stand-off posed to bilateral ties and both sides expressed satisfaction at its resolution "through concerted diplomatic communications" when they met on Monday, the External Affairs Ministry said. A day after media reports on the Chinese version of what transpired at the meeting, the External Affairs Ministry said both sides expressed satisfaction over the way the 73-day standoff was resolved. Confirming that the Doklam issue was discussed by India and China when the Foreign Ministers of the two countries met on December 11, External Affairs Ministry Spokesperson Raveesh Kumar, in a statement said both sides noted the "challenge" the 73-day standoff posed to bilateral ties. On Tuesday, China had issued a statement giving details of the meeting. According to it, Wang, in the meeting, had said that the military stand-off in Doklam had put a "severe" strain on bilateral ties. He blamed it on "viciousness caused by the cross-border infiltration of the Indian border guards". 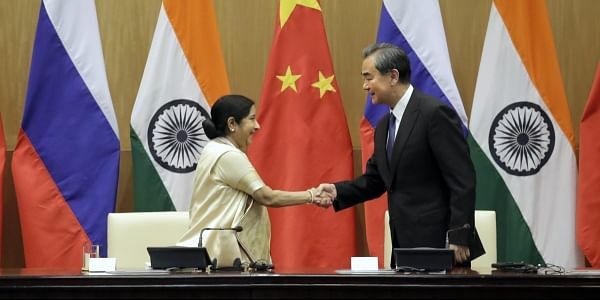 "EAM (Sushma Swaraj) and Chinese Foreign Minister both noted the challenge it had posed to the relationship and both expressed satisfaction that it was resolved with the disengagement of troops at the face-off site through concerted diplomatic communications," Kumar said. According to the Spokesperson, Wang said that the peaceful resolution of the Doklam issue reflects the political maturity on both sides. While agreeing with this, Sushma Swaraj reiterated that "maintenance of peace and tranquility in the border areas is an essential pre-requisite for the smooth development of bilateral relations". She also underlined the need for approaching their bilateral difference with due consideration to each other's sensitivities and concerns. "She recalled the consensus between the leaders of India and China reached in Astana earlier this year on the need to work together to ensure that our difference do not become disputes," Kumar said. Wang also said that India and China share the same objectives of national development and should be natural partners. "To this end, both Foreign Ministers agreed to strengthen strategic communication at all levels, including between them, through the established dialogue mechanisms," the spokesperson added. Wang was in Delhi for the Russia-India-China Foreign Ministers' meeting. The armies of both countries were locked in a 73-day stand-off at Doklam in the Sikkim section of the Sino-Indian border over the building of a road by the Chinese military in the area that is claimed by Bhutan. Indian troops stalled the work citing the disputed status of Doklam and its proximity to its key artery in the northeast. The crisis was resolved on August 28 after both the armies retreated from the point of the face-off, days ahead of the BRICS summit in China. He said a "similar atmosphere" existed today when people were coming forward to fulfil their responsibilities towards the nation. Modi said the hopes and aspirations of people were to rid the country of internal problems like corruption and black money.